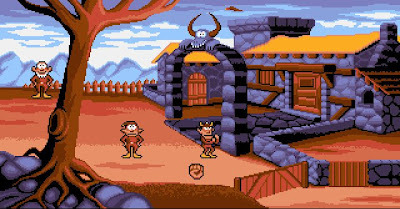 Alan posted a while ago (actually, 1,5 years already) about the classic game 'Gobliiins' appearing on the French cd-i discs 'ADI CM1' and ADI CE1'. 7 levels are available on each disc. The first level is available straight away, but you need to unlock later levels by studying! Alan confirms that to unlock later levels, you need to gain 20 points, which doesn't take too long at all. As long as you know your French!! For our dutch readers: Tonight at 18:16 PM (Timezone Amsterdam, Paris GMT+1) you can watch on the dutch themed streaming channel "Geschiedenis24" (History themed stream at www.geschiedenis24.nl) a new edition of "Hollands Glorie". This edition is dedicated to the 120th anniversary of Philips Electronics and therefor is about the history of Philips including attention to inventions like DCC and CD-i. For those interested in Philips in general and CD-i specific, watch tonight on Geschiedenis24. In fact, this channel is dedicated to Philips the whole week to Philips, find here lots of programs they will broadcast about the company history. The Philips company is 120 years old this week. It surprises me there's zero attention about this. For us it's a memorable week as Philips is the mother of CD-i and lots of videogaming facts. It's also a bit sad to realize all references to its multimedia history are disappearing, even more now Philips intends to close the Redhill Research facility and move the remaining departments to Cambridge. Philips Research Redhill was the centre for a lot of CD-i developments.